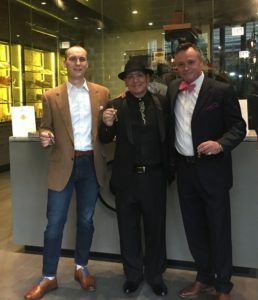 Bespoke Cigars has been on the USA market on and off since 2002, but since the founding of it’s dedicated USA distribution company, The Bespoke Company, headed by Vlada Stojanov in 2017 its presence has been steadily growing. Bespoke Cigars is available at a number of premier shops around the country including The Clayton, The Small Batch Company, Cigar City, Chivas and Dallas Blue Smoke to name a few. Currently our focus is on being in premier shops and lounges. Bespoke Cigars has also been acknowledged by the US based cigar blogger “the Katman”, who has named two vitolas of Bespoke Cigar’s production as his Cigar of the Year and rated another 5 with high points over 95. The cooperation of Tony Serino and Bespoke Cigars goes back to 2001, when Bespoke Cigars made its first efforts to start a production of Bespoke cigars in the Dominican Republic and Tony organized the importation of these cigars to Florida. Since 2017 Nino Vasquez is the official importer of Bespoke Cigars brand in the USA.